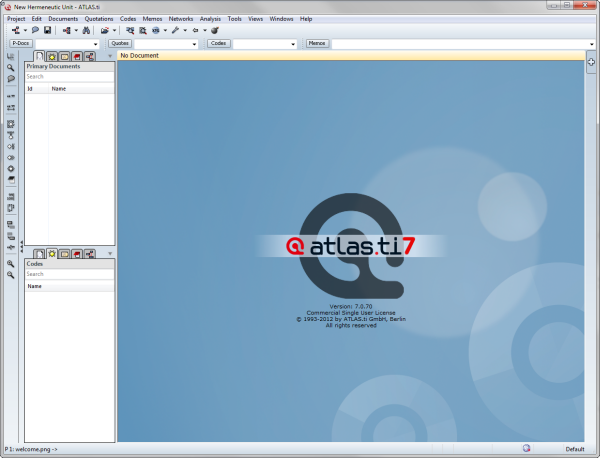 This issue of INSIDE ATLAS.ti is dedicated to the long-awaited release of version 7 of ATLAS.ti earlier this month. While development took slightly longer than anticipated, we are convinced that the final result is truly the best ATLAS.ti ever, by far. Once again we have managed to push the envelope, if not set completely new standards for contemporary qualitative analysis software. But do not take our word for it. Download and test-drive ATLAS.ti 7 for yourself: Kick some tires, play with its shiny buttons, admire its new, sleeker design, but then get behind the wheel and take your data for a serious ride. The free and practically unlimited trial version is available from http://freetrial.atlasti.com. Detailed information about changes and descriptions of its great new features are available from http://whatsnew.atlasti.com, along with a detailed instructional document for upgraders from v. 6. Here's an interesting tidbit: If you use ATLAS.ti on a Mac through Parallels, you may be interested that our developers discovered and brought to the attention to the Parallels people a serious multimedia bug in Parallels. This problem had remained hitherto undetected since, apparantly, no other application takes multimedia data to task the way ATLAS.ti does! Our development team is currently in contact with the Parallels people to assist them in sorting out this problem. Until Parallels is able to offer a fix for the "green video" problem, please use the workaround described in the ATLAS.ti Knowledge Base if you run into this bug. On behalf from everyone here thank you for all the input into the new version! We hope you enjoy the new ATLAS.ti 7 as much as we do—and we enjoy it a lot! It's done!!! It's been a hard day's night--or, to be more precise, three years of hard, sometimes frustrating but mostly rewarding work on ATLAS.ti 7 which was finally released on June 4. Let me express my personal gratitude to all our users who have provided feedback, bug reports and suggestions in a very productive and creative way. Some have been engaged in the external beta test and did an exceptional job hunting down annoying bugs and flaws in the workflow and user interface. My gratitude also goes to our team of developers, the documentation writers, the coordinators and those working in the back office. Despite certain delays, this version has had the overall shortest development time until now but contains by far the most significant improvements in functionality and usability of all major version steps of ATLAS.ti! One of the main design decisions for the new version was not to break with our current principles of giving the user the established high degree of freedom, being "non-deductive" not only in the logics of the structures and workflows but also in the user interface. Yet, one annoying "feature" of all previous incarnations of ATLAS.ti was addressed very efficiently, the quickly increasing number of open windows cluttering the ever-limited screen estate. We solved this problem not by replacing our UI with the Outlook-like "tiled" constructor-set solution so readily adopted by many (which would quickly reduce the core part of the interface, the document and margin area, to a tiny space). Such a strategy simply does not work for a complex world. •We combined tools that usually required separate screen estate. 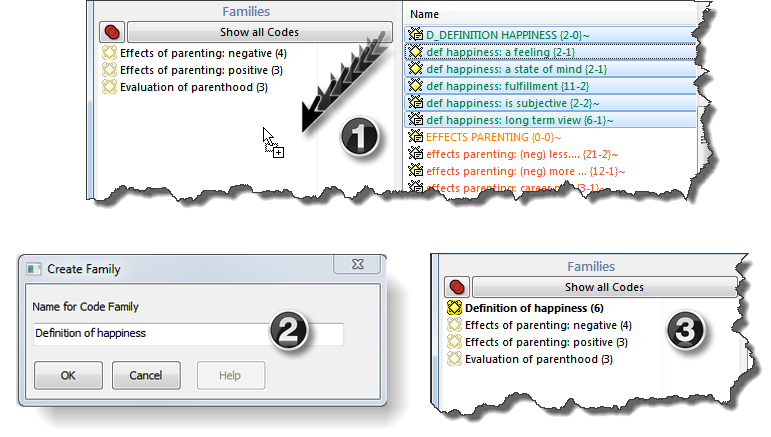 Instead of opening the Code Family Manager in addition to the Code Manager to view and edit membership, to filter, to create queries, the new managers have an option side panel displaying their families. •Up to four different documents with their margin areas of arbitrary type can be displayed side-by-side in the HU editor. This was previously only possible by opening the same HU in different editors. These "document regions" also "know" each other in cases where the documents are somehow related (e.g. a transcript-media twin of documents linked via hyperlinks). This not only effectively combats screen clutter but also significantly improves "closeness to the data," a philosophy that we have followed since the early days twenty years ago. •The fly-out side-panel: Move the mouse over the fly-out region next to the vertical tool bar and a selectable collection of mini-managers are displayed. Of course you can switch the panel on permanently. 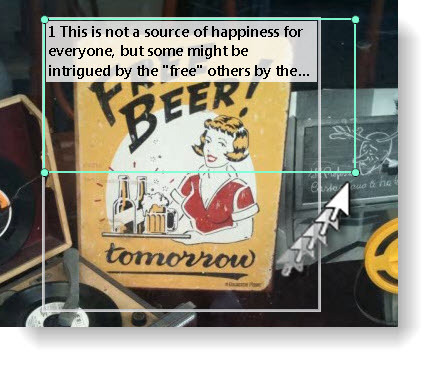 •Up to Godzilla-sized (512x512 pixel) preview images of items content, e.g. 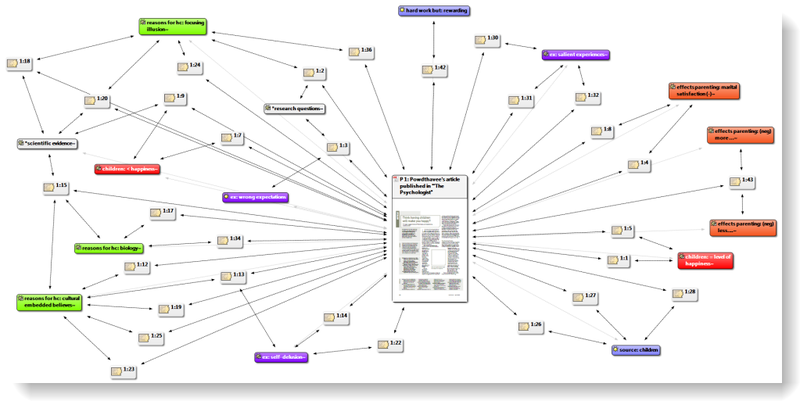 primary documents, network views, memos in the respective managers. This makes finding the right network view very easy, and frequently you don't even have to open it then. With PD previews, the necessity for the sometimes "heavy-weight" action of loading a document is also reduced. •Search filter in every manager: type some text and quickly filter the items matching the pattern. So less space for managers still shows all you need. If there were a single feature that deserved exceptional praise, the new multimedia user interface and "engine" would be an adequate candidate. Well, compared to the previous state of affairs, nearly every change would have been an improvement!-) Our design goal was to enable our interactive margin area to serve multimedia documents as comfortably as any other margin-enable document type like text, PDF, graphics. And we did. This was a true engineering highlight, and we are proud to have one of the world's best programmers doing this project. (Of course, ALL our programmers are exceptional!) While up to now working with multimedia resembled, to a degree, stumbling in the fog (especially when documents became long--although shear file size was never a problem for ATLAS.ti), the integration of multimedia into the ATLAS.ti workflow is very close to perfect. 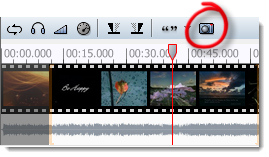 Multimedia files now display waveforms and frame previews (for videos), allow zooming and easy selection, overlay of quotations and perfect side-by-side display with optional transcripts. Well, you have to see it. For all those working with network views – one of our USPs - there is also lots of good news: Smooth, non-flickering crisp views, zoomable, individually resizable nodes, previews of image, text and PDF docs, excellent printing and cut & paste, animated layouts, and, and, and. Behind the scene we now have an iTunes™-like document management system that we expect to greatly reduce any of the well-known "referential" issues ("where is my document?"). When assigning documents they are now imported into one of two libraries which addresses the referential problem and at the same time checks and if needed enhances the quality of the imported documents. 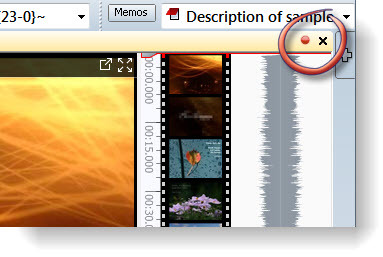 For instance, if you are working with multimedia, you most probably prefer MP3 files as audio data. Quite a few of those are created in such a way that makes them play back fine, but causes real problems with accurately retrieving a previously stored position. Alas, proper positioning is quintessential to a coding system. Our solution: Variable bit rate (VBR) MP3 files are now automatically converted into WMA files that support high precision coding. 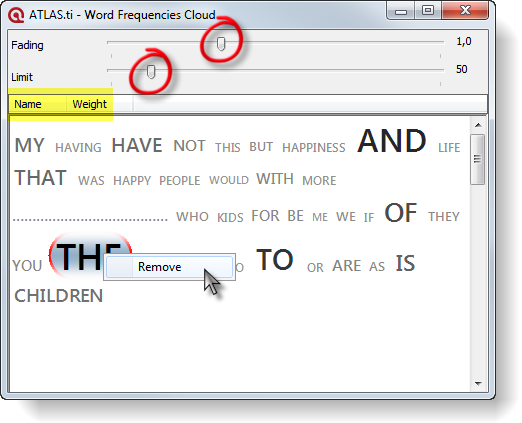 Similar for text files: Word documents are converted to rich text only ONCE and imported into the library. This also solves a few time-honored issues: You can now edit such documents, load performance is increased, and there is no problem with migrating projects between computers without proper converters installed (meaning conversion could fail and documents could not be opened). Have to stop here. Just quickly also wanted to mention some of the other highlights: Code cloud views in code manager, frequency bars in code and pd manager, word clouds crunching, import meta info from MP3s, images, PDFs, a file conversion engine (DOCs, ODTs to PDF or RTF), new powerful stylesheets (reports) for the XML converter, menus cleaned up and rearranged. Have I left out anything? Most certainly! Just one last thought: Of course, "Done!!" is always releative. You may know the adage, slightly adapted, "After a release is before a release." For us here at ATLAS.ti it most certainly is! A whole slew of new ideas and suggestions are already on the agenda, and some rather interesting things will be made available by our continuous (free) update process in the time coming. Thank you for your patience in reading this. Enjoy the new ATLAS.ti 7! 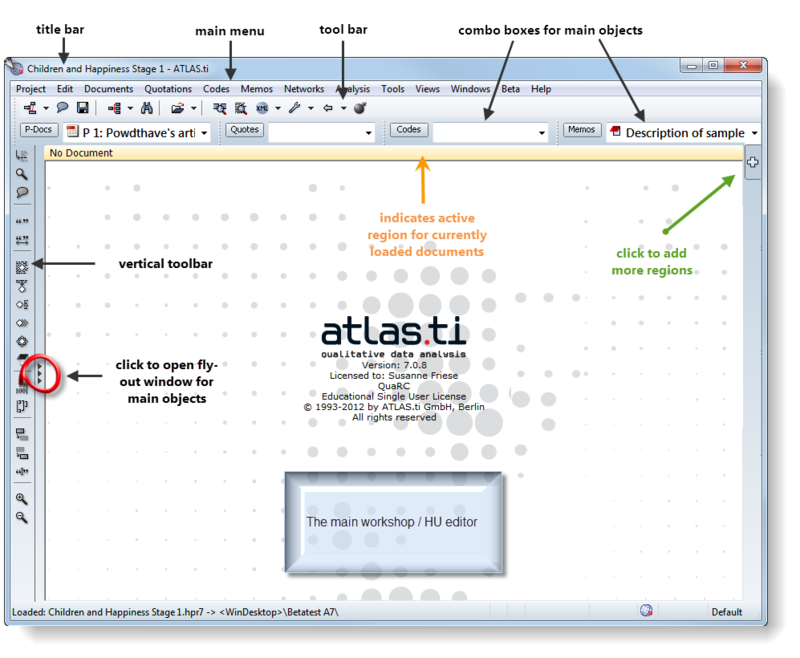 The ATLAS.ti user interface has undergone numerous extremely usability-enhancing changes. These changes will increase your productivity but still let you get to work without interrupting your work flow. New interactive side panels let you maximize the available workspace while giving you immediate access to preselected lists of objects at all times. Have all your tools where you need them - but only when you need them. Panels can be minimized and resized, and be used for any purpose, such as coding, creating hyperlinks, and access management to your primary documents. They can be displayed "on the fly" or docked for permanent use. ATLAS.ti 7 now gives you detailed access and a frame-level preview of video files. High-precision navigation is a must for in-depth media analysis. Create PDs frame-level work for in-depth scene coding and multi-dimensional analysis. All codes display in the margin area – just as nature intended! 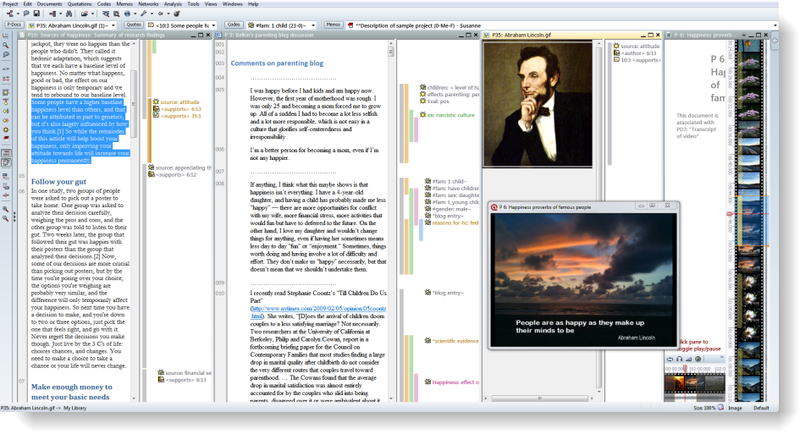 Audio and video now share ATLAS.ti‘s central metaphor for presenting and working with content: the margin area. Text, PDF, images, audio, video – all utilize the same powerful workspace, arguably the most natural "work environment" for the qualitative researcher. 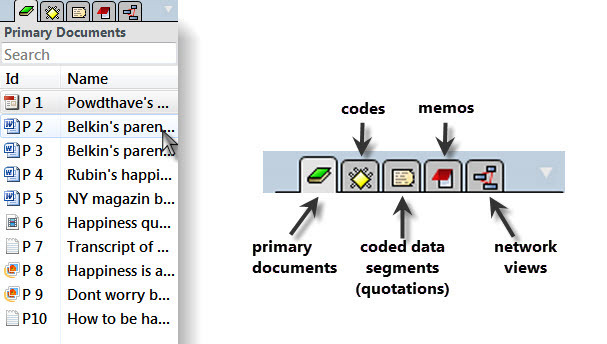 Coding audio and video works just like you're used to from text documents: In the margin area. Couldn't be more intutive and fast! 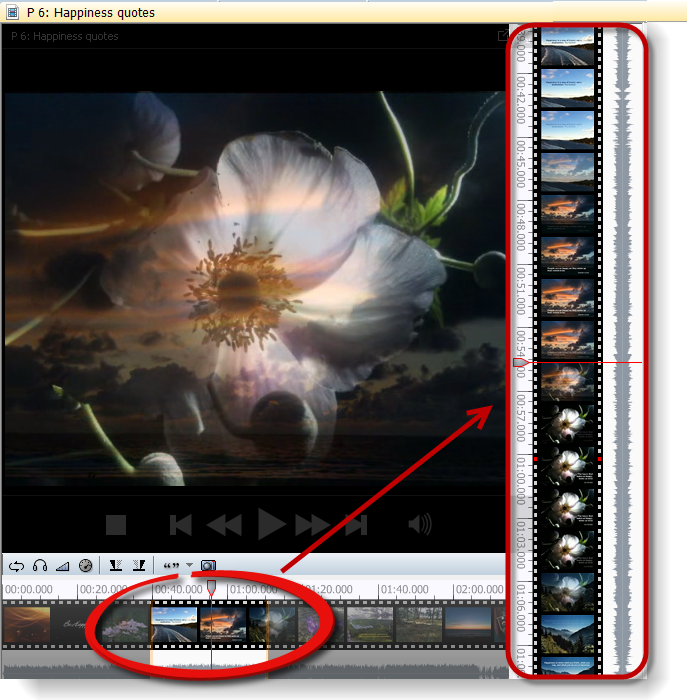 You can load up to four documents into the new HU editor document regions for simultaneous viewing, coding, linking. That's what qualitative data analysis should be like! One document is not enough - work with up to four simultaneously--including the usual margin area for each. Time to get that large screen; now you can REALLY put it to use! 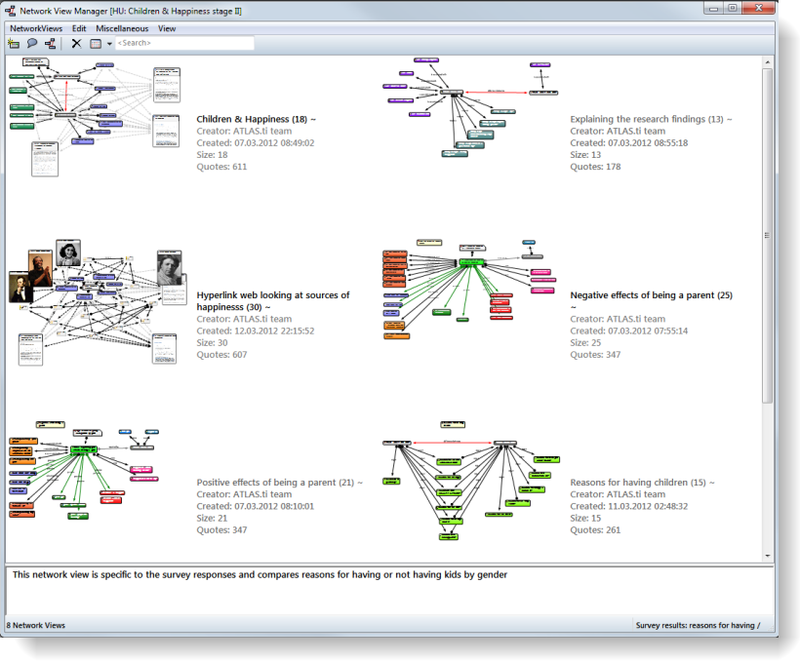 ATLAS.ti's semantic network views have been drastically improved, both visually and functionally, into a powerful anaytical tool, fully integrated into the analytical process. Network views are ever more a powerful, closely integrated work tool. It doesn't hurt that they're now pretty, too. Capabilities have been vastly improved so you can perform many important tasks conveniently directly from the visual network view. Get the full picture at just once glance - all codes associated with a document. 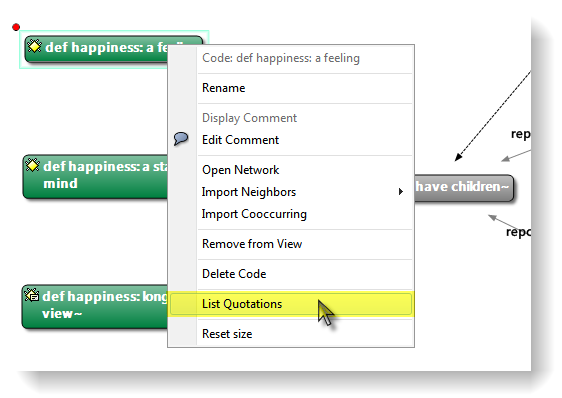 If you import the associated quotations as well, you can expand the network to a full case-based view. And, of course, all networks can be printed in high quality or saved as a PDF file. 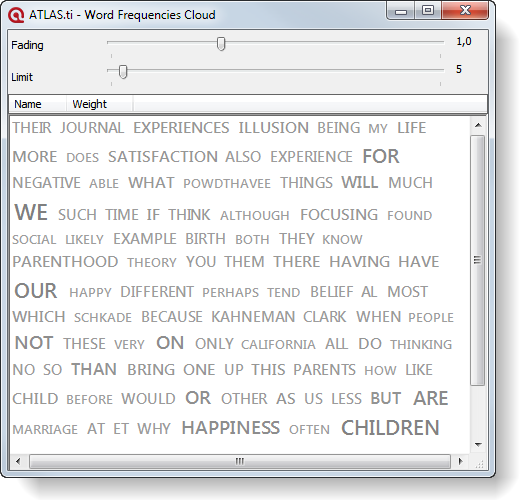 The Word Cruncher can display word frequencies as a Word Cloud to make for quick, intuitive work flow. Faders let you control the display of word frequency and select a cut-off for words you want filtered out. ATLAS.ti 7 provides fast, flexible and secure document management through Managed Documents. This powerful new concept ensures referential and content integrity to make users' life easier. You now have a choice if you want to keep your project files stored in their original location (as before) or if you want ALAS.ti to handle all document management tasks for you, safely and securely. The managed document concept also includes a "team library" that contains shared material for collaborative work. You can retain the project document structure you're used to, or convert your legacy HUs to managed docs. 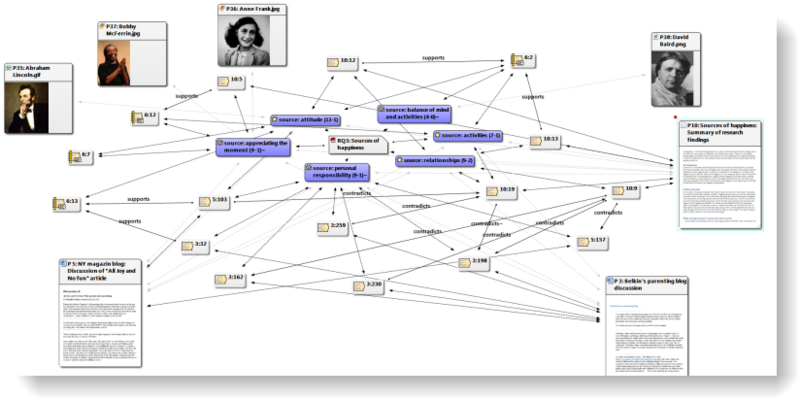 If your document contains internal metadata, ATLAS.ti extracts them automatically and uses them appropriately by creating families or comments for your objects. Import audio files, videos, PDF or Word documents. Available meta data (such as ID3 tags or other document property information) is immediately put to productive use. 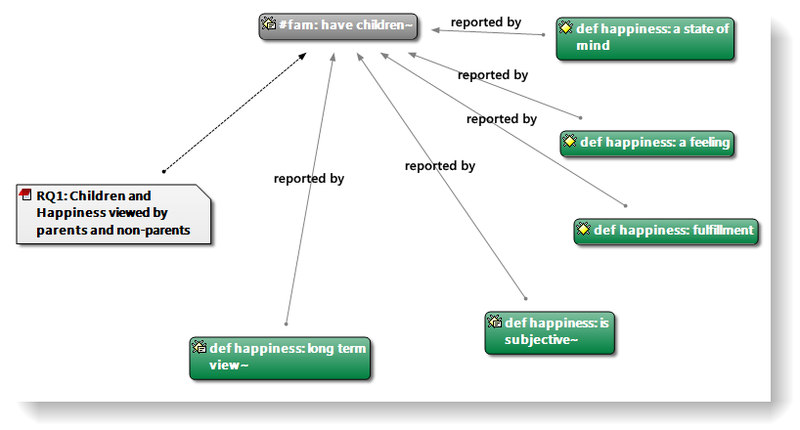 ATLAS.ti comes with many powerful report formats pre-programmed. They not only enhance results output but also provide powerful instant feedback during the analytical stages of your work. Added preference settings on cooccurrence tables. 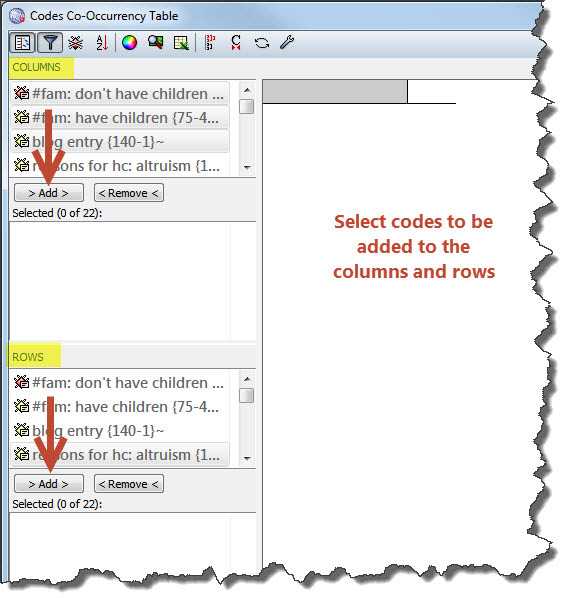 Column and row width can be set, code colors can be selected for cells. 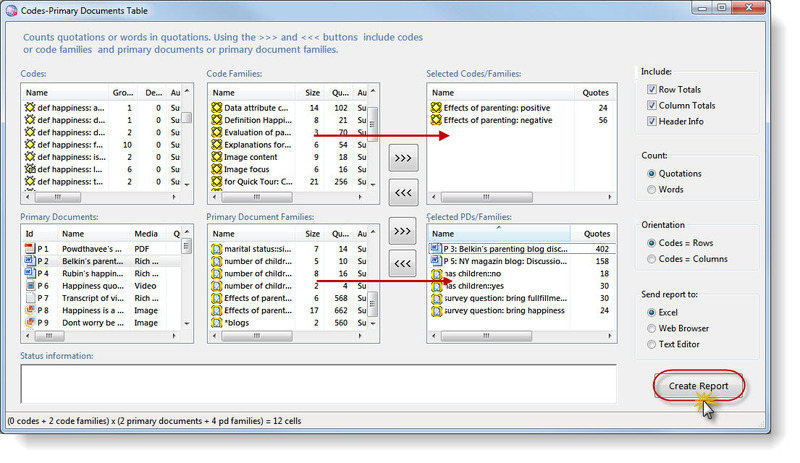 Codes-Primary-Documents table – do not only choose codes and Pds for cross-tabulation, now you can create tables also on an aggregated level based on code and PD families. 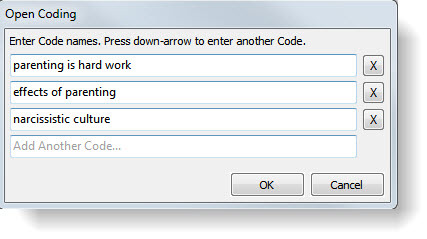 In addition, you can select whether the codes should be displayed in the codes or the rows. Less much additional formatting and calculation in Excel is necessary. Filter settings now also available in network views. All objects excluded by the filter are faded out. Users of ATLAS.ti 6.x can upgrade to ATLAS.ti 7 at a substantially reduced rate (nearly 50% discount). This offer is limited and may end at any time. To upgrade, simply go to http://order.atlasti.com, select your existing license type and "upgrade." Enter your existing license key when asked. With your purchase of the upgrade you will receive a setup file and a new license key. Use this license key to activate the upgrade after installation. Please note that for technical reasons version 5 can upgrade online only if the license was properly registered at the time of purchase. Versions older than 4.2 cannot be upgraded online. For these cases, please contact our support. Student licenses cannot be upgraded from ANY version, but if you have full-time student status,you can apply for a new student license at the highly discounted student rate. Our support team will also be happy to assist you in obtaining the proper upgrade in case of problems or questions. Write to [email protected] and include your license key and any additional information you have (license type and size) for fast and efficient service. In this new category, we will be introducing different features and tools of the new ATLAS.ti 7 through practrical examples. Look for more hands-on introductions of this kind in upcoming issues of INSIDE ATLAS.ti. 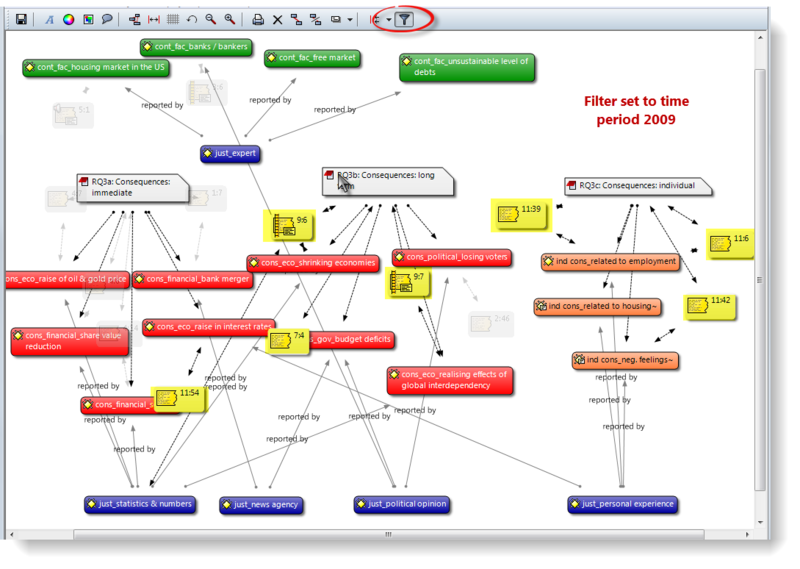 The following example demonstrates how the new filter options greatly advance the analytic power of ATLAS.ti network views. 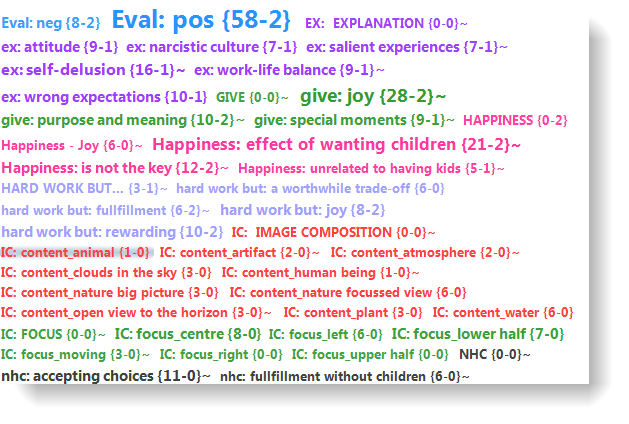 The example is based on the A7 sample project "Children & Happiness stage II", albeit somewhat modified, as the stage II project already includes network views and links. If you want to follow along, download the modified sample project here. A description of the sample project can be found in the first memo. 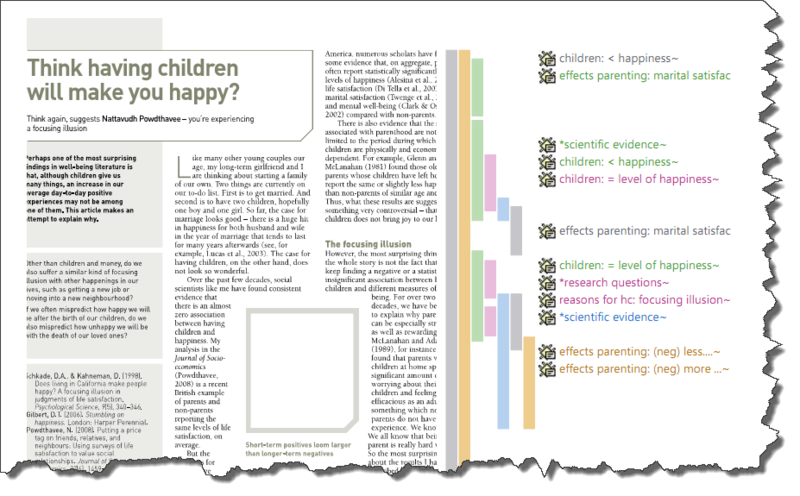 I will show you how to find an answer to one of the questions posted in the memo: RQ1: Children and Happiness viewed by parents and non-parents. 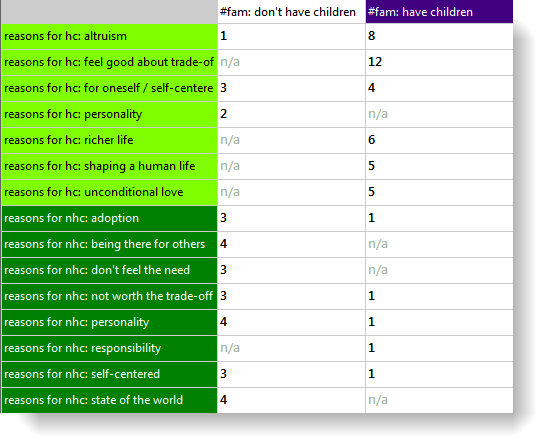 Based on the data set, is happiness defined differently by those who have children as compared to those who do not have children? 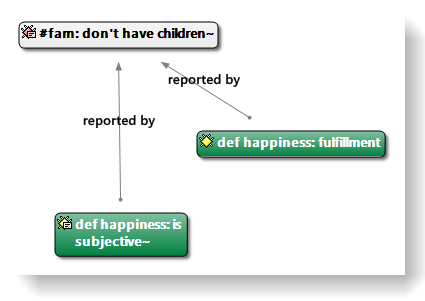 It includes all codes of the definition of happiness category + the two attribute codes #fam: have children and #fam: don't have children. 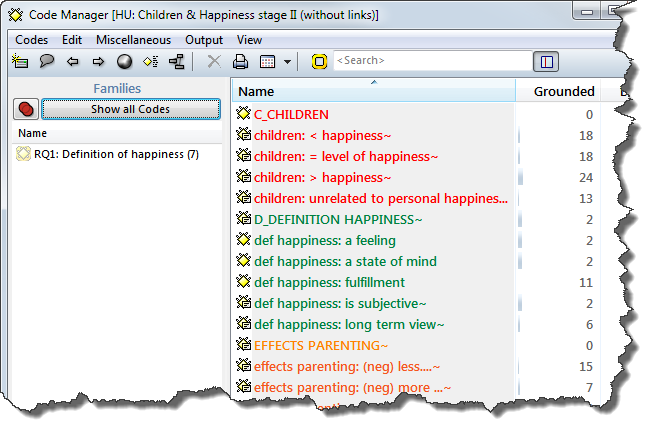 Activate the filter by clicking on the code family in the side panel holding down the ctrl+shift key. 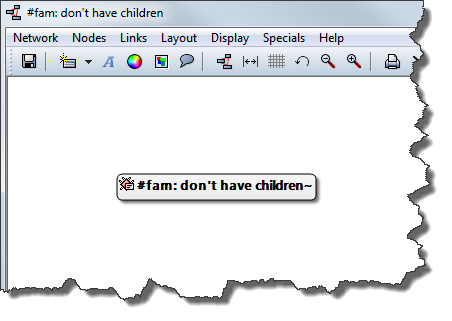 Right-click on the first attribute code “#fam: don't have children” and select the option Open Network View. 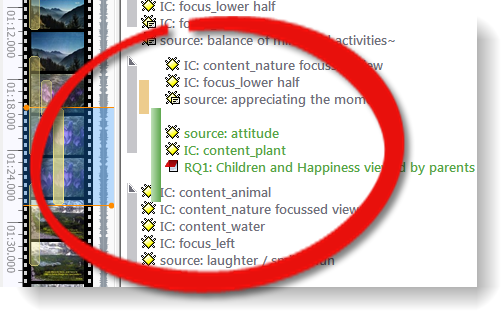 As the the entire length of each blog post is coded with the appropriate attribute code, we can now import the cooccuring codes that mark those segments within each blog post where respondents have provided their own definition of happiness. 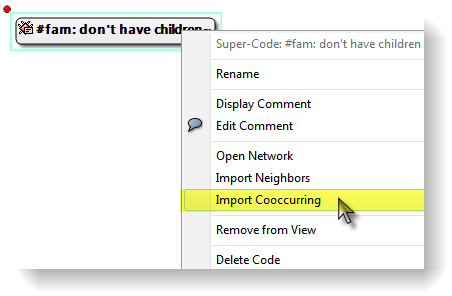 Right-click on the code node in the network view and select the option Import Cooccuring. Two codes are imported. Link them to the attribute code using the relation “is reported by”. Close this network view. There is no need for saving it. Repeat the importing and linking process for the second attribute code “#fam: have children”. The memo was previously already linked to the “#fam: have children” code and therefore is be displayed when you open a network view on the code. 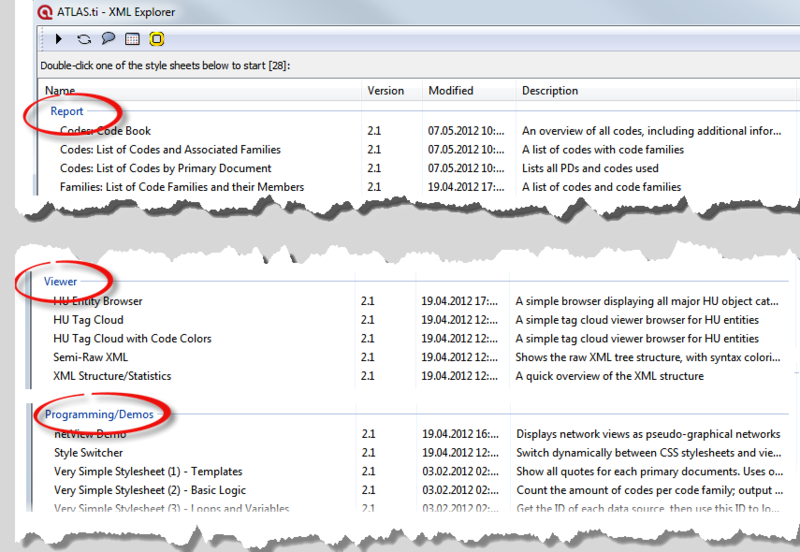 Now drag & drop the “fam: don't have children” code from the Code Manager code into this network view. The already existing linkages with the appropriate definition codes become visible instantly. Arrange the nodes in a suitable way so it best reflects the answer to the research question. To save the network view, select Network / Save as Graphic File. 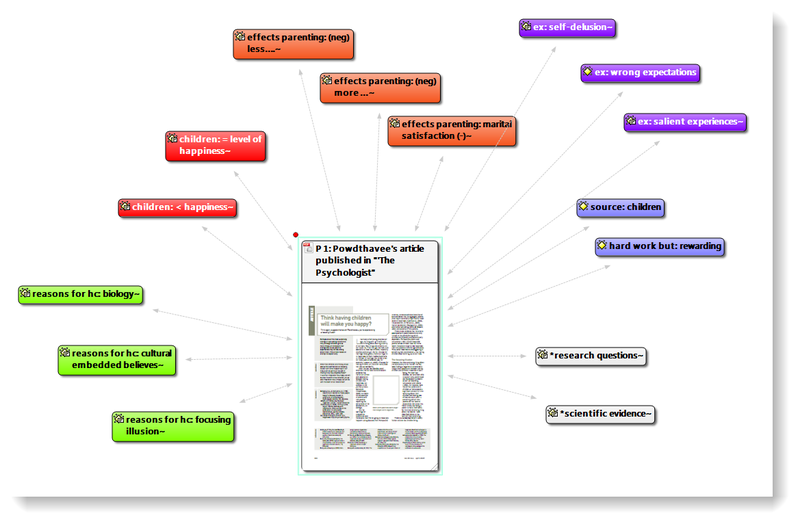 To compare individual responses of non-parents and parents, there are actually different ways to achieve this. You can for instance use the Code Cooccurence Table applying the same filter setting. How this works will be explained in the next newsletter. I read somewhere that the decision had made to keep the same general interface design for version 7. Goodness, I'm certainly glad of that. The simplicity and appeal of the general interface is what sets ATLAS.ti apart, it is the ATLAS.ti brand, and so I hope there will never be a major change to that! When I demonstrate version 7, people are really appreciating the new navigation panels and the ability to have more than one document open. This allows hyperlinking to be brought into the mainstream of many more projects, which is going to be great. 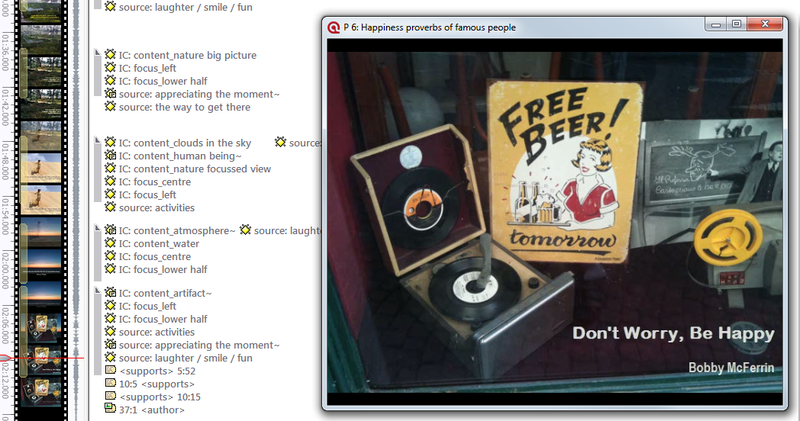 The people I work with LOVE being able to export the content of graphic quotations to the rtf output files. This makes graphical analysis very practical, and this alone has led some of my people to decide to upgrade right away. Hopefully managed projects will put an end to the file management problems of all the less techy researchers, but I have yet to be able to experiment to see if it works smoothly in a team context. Hopefully so, which will then be a huge advance. The redesign and upgrade of network functionality makes it much smoother to work, and the ability to have different size nodes are terrific. If you are one of the early adopters and have already either downloaded the trial version, or purchased a license or an upgrade, we are eager to hear from you! Let us know about your experience and your first impression of what we think is the new state of the art in qualitative data analysis. We invite your via [email protected].